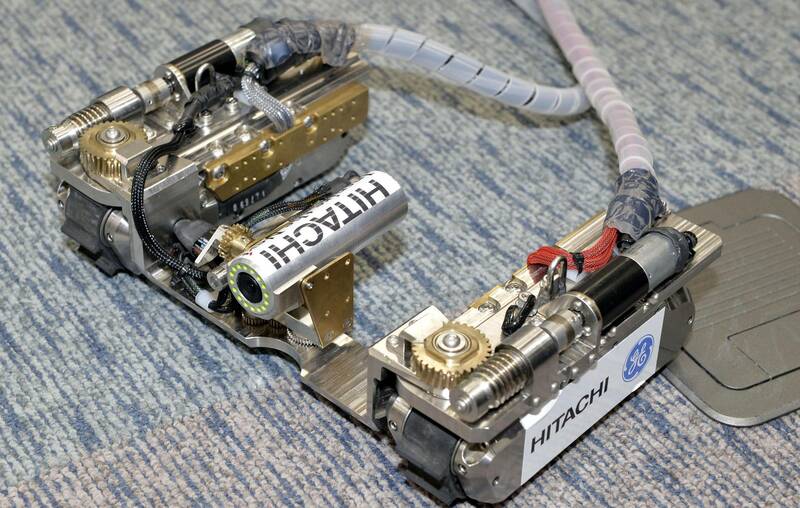 Hitachi Ltd. and Hitachi-GE Nuclear Energy Ltd. say they have developed robots to detect cooling water leakage points and the condition of nuclear fuel at the disaster-struck Fukushima No. 1 nuclear plant. One robot can move through narrow pipes by changing shape and another can move through radioactive water to perform research related to the task of removing melted nuclear fuel. The robots should be able to move around inside the containment vessels of the reactors that experienced meltdowns, and whose dismantling poses never-before-seen engineering challenges. The robots are to be used to go inside the containment vessels through pipes to check pressure vessels or probe the bottom of the containment vessels where contaminated water accumulates, the companies said. 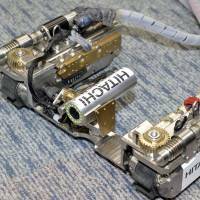 The shape-changing robot weighs 7.5 kg and can move like a snake inside pipes as narrow as 10 cm in diameter. It also can “walk” on rough floors with differences in levels of up to 5 cm. The robot to be used under water weighs 31.5 kg and is equipped with six propellers, enabling it to move both vertically and horizontally to avoid obstacles. It can also “stably walk” at a 90-degree angle by sticking onto walls, the companies said. Fukushima No. 1, radiation, Robot, HItachi-GE Nuclear Energy Ltd.